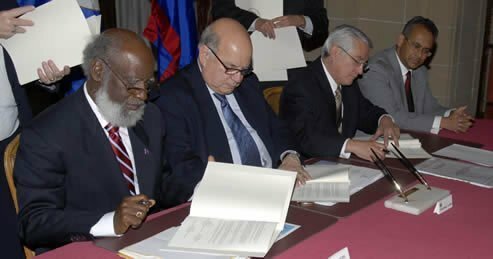 The document in question was signed by Belize’s Foreign Minister, Honourable Wilfred Elrington in December 2008 at the headquarters of the Organization of American States in Washington D.C, in the United States of America. 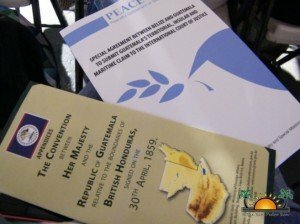 The signing of this document (Special Agreement) was a binding agreement by Belize to submit the Guatemalan claim to Belize to the ICJ. This move by Elrington on behalf of the Belizean people is being argued as unconstitutional, as Belizeans were never consulted before the signing. The constitutional challenge was filed at the court by PUP Senator and attorney Eamon Courtenay based on the legal opinions provided by attorneys Anthony Sylvestre, Richard ‘Dickie’ Bradley, and Kareem Musa. According to these attorneys, their research of the law has led them to conclude that the Special Agreement, signed by Elrington, violates the Belizean Constitution as it grants power to the ICJ to alter Belize’s borders. According to them, this is unconstitutional since such a process requires a two-thirds majority vote in the House of Representatives. During the court hearing, Chief Justice Kenneth Benjamin pledged to give a ruling before the referendum day. Arguments on the claim were heard from PUP Area Representatives: Honourable Michael Espat, Honourable Oscar Requeña, Honourable Rodwell Ferguson, Honourable Julius Espat and Deputy PUP Party Leader Honourable Cordel Hyde. Accompanying them was also the standard bearer for the Pickstock constituency Anthony Mahler. Disputing the PUP claimants were Prime Minister Right Honourable Dean Barrow, the Chief Elections Officer, the Ministry of Foreign Affairs and the Attorney General, who was represented by the Office of the Solicitor General via attorney Lisa Shoman. When both teams emerged from the courtroom, Shoman told the reporters that the hearing date had been set for the urgent interim injunction that the claimants asked for. She further explained that the claimants asked the court to restrain the Prime Minister from asking the Governor General to issue a writ of the referendum. Shoman, however, added that such writ was issued in February of this year. “So, what we will be arguing over, in terms of the injunction only, will be whether the matter can and should be conducted,” said Shoman. The former foreign minister, who served under a PUP’s administration, stated, “You know this is not PUP or UDP, it’s about Belize and let me remind everybody that it is the PUP that started this journey; they knew we were going to go to the ICJ,” said Shoman. On the other hand, Hyde considers the matter to be very serious and is pleased that the Chief Justice has agreed to hear the case. He emphasized that people must be included in any paramount decision to be taken by any government. “Under the laws of Belize, the people of Belize have the final say; they have a veto over any proposed final settlement with Guatemala. In other words, we get to agree or not on any proposed settlement with Guatemala,” said Hyde. “What you have under the Special Agreement is a proposal to outsource that power to 15 foreign judges,” Hyde stressed that Elrington does not have the authority to bind the Belizean people via such agreement without getting input from them, through their parliamentarians in the National Assembly. Hyde continued “If we go to the ICJ under this Special Agreement, our borders, what we know as Belize, can be altered. If we go to the ICJ under this Special Agreement, the people who live down south may not be Belizeans when all is said and done.” This is based on the speculations that Guatemala is claiming more than half of Belize, particularly the southern portion of the country. Courtenay also spoke to the media stating that there are compelling reasons for this matter to be before the court. “That’s why I stressed to the Chief Justice that even the government itself is saying that this matter is of national importance,” he said. “If both sides agree that this is a matter of national importance, it seems that the government could easily give an undertaking that they will put off the referendum until the Supreme Court has determined this matter.” He reminded Belizeans that Guatemala postponed its referendum twice after its original date in 2013. Courtenay said that if the court does not stop the referendum, they will move to an emergency basis to the Court of Appeal, and if necessary, to the Caribbean Court of Justice as well. The case will return to court on April 1st where the Opposition is hoping to get an injunction to postpone the referendum slated for April 10th.